Photos depict the G-3 flying while new Remos CEO Corvin Huber poses in front of the new GX with movie star Harrison Ford. As present Chairman of the Young Eagles, Ford is active in helping kids to fly. At EAA's Gathering of Eagles fund raiser at AirVenure 2008, movie stars Harrison Ford, John Travolta, and Cliff Robertson plus golf legend Arnold Palmer took the stage. With their encouragement, EAA raised a ton of dough that night. Young Eagles is a great program, having flown more than 1.4 million kids. But it isn't the organization's only youth-in-aviation initiative *** Some 260 kids aged 12 to 18 attended summer sessions in Oshkosh this year. 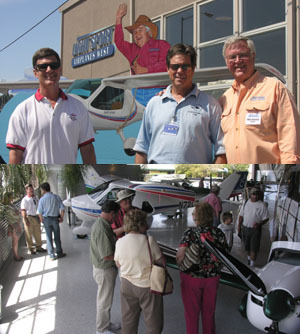 Programs varied, said EAA, but every student got to fly a Remos G-3 for 20 to 30 minutes. "The Remos is fun to fly and easy to control," said Bob Campbell, Director of the Air Academy. "Students held the controls until it was time to land and were able to log the time. 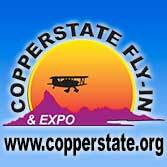 It's our hope that it will be the beginning of a Sport Pilot [certificate] for each one." *** Remos Aircraft benefits from having a dealership based right on Wittman Field, the airport that plays host to AirVenture each summer. Orion Flight Services is where I flew the new GX model for a pilot report to appear later. All I can say is...those lucky kids! *** The Air Academy programs house 48 students per session in a handsome log and stone dormitory built on the southeast corner of Pioneer Airport. At EAA’s Gathering of Eagles fund raiser at AirVenure 2008, movie stars Harrison Ford, John Travolta, and Cliff Robertson plus golf legend Arnold Palmer took the stage. With their encouragement, EAA raised a ton of dough that night. Young Eagles is a great program, having flown more than 1.4 million kids. 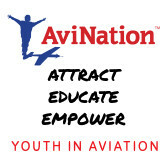 But it isn’t the organization’s only youth-in-aviation initiative *** Some 260 kids aged 12 to 18 attended summer sessions in Oshkosh this year. Programs varied, said EAA, but every student got to fly a Remos G-3 for 20 to 30 minutes. 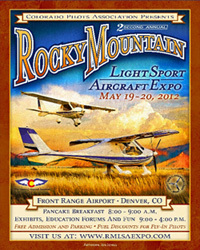 “The Remos is fun to fly and easy to control,” said Bob Campbell, Director of the Air Academy. “Students held the controls until it was time to land and were able to log the time. 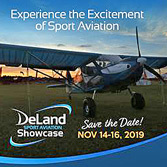 It’s our hope that it will be the beginning of a Sport Pilot [certificate] for each one.” *** Remos Aircraft benefits from having a dealership based right on Wittman Field, the airport that plays host to AirVenture each summer. Every month my Czech friend, Jan Friedrich, compiles FAA registration data. These data are available to anyone but it takes a several hours to comb through the database while applying industry knowledge because the information, while accurate, is not straightforwardly presented. Welcome to Just Aircraft, who qualified for the Top 20. 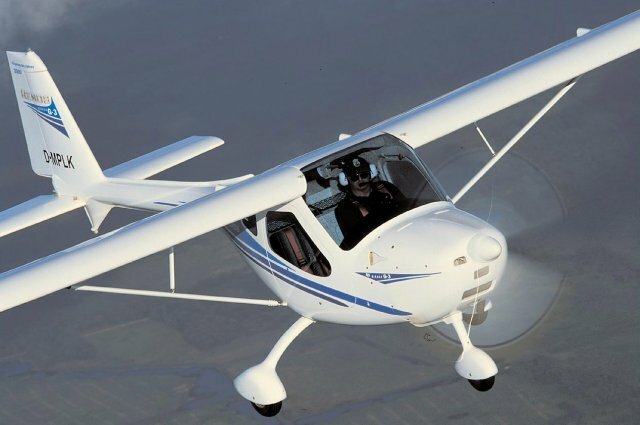 Through the first six months of 2008, Light-Sport Aircraft deliveries have reflected the same challenges afflicting the rest of general or sport aviation...and for that matter, the overall U.S. economy. In fact, LSA registrations aren't off as badly as are GA deliveries, perhaps due to significantly better fuel economy in an LSA. These FAA registrations can be analyzed to show trends. 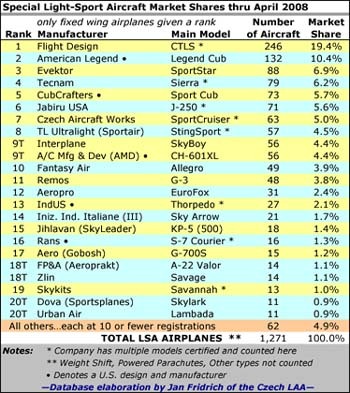 *** In the first half of 2008, the LSA industry registered 248 aircraft, which is 22% of all registrations from April 2005 through December 2007 (1,118). Many find it interesting to observe how market leaders compare. If a supplier registered less than 22% of their fleet in 2008, they slipped in market share (even if they registered more total airplanes). If they exceeded that figure, they gained market share. 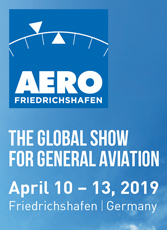 In the first half of 2008 gainers included: Remos up 62%; Czech Aircraft Works 47%; FPNA 45%; Gobosh 38%; Tecnam 35%; Aeropro 32%; and AMD 28%. All brands named above had a smaller total number of previously-registered aircraft than the leading sellers, so the percentage value isn't particularly meaningful other than to rank the increases by brand. 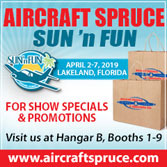 *** By the number of aircraft registered, Flight Design stayed out in front adding 33; Tecnam 24; CZAW and Remos 21 each; American Legend 18; AMD 13; and CubCrafters 10. Through the first six months of 2008, Light-Sport Aircraft deliveries have reflected the same challenges afflicting the rest of general or sport aviation…and for that matter, the overall U.S. economy. In fact, LSA registrations aren’t off as badly as are GA deliveries, perhaps due to significantly better fuel economy in an LSA. These FAA registrations can be analyzed to show trends. 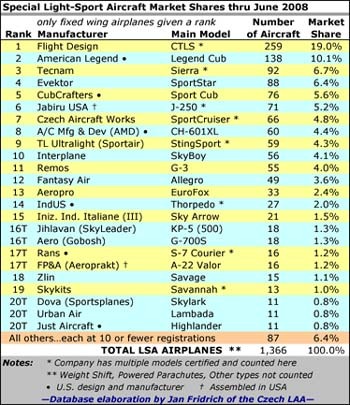 *** In the first half of 2008, the LSA industry registered 248 aircraft, which is 22% of all registrations from April 2005 through December 2007 (1,118). Many find it interesting to observe how market leaders compare. If a supplier registered less than 22% of their fleet in 2008, they slipped in market share (even if they registered more total airplanes). If they exceeded that figure, they gained market share. In the first half of 2008 gainers included: Remos up 62%; Czech Aircraft Works 47%; FPNA 45%; Gobosh 38%; Tecnam 35%; Aeropro 32%; and AMD 28%. Read More About: Czech Sport Aircraft Eaglet G-3 Highlander Just Aircraft LSA Market Shares Remos Aircraft GmbH SportCruiser (formerly PiperSport) Tecnam Costruzioni Aeronautiche Tecnam US Inc.
Aeropro's EuroFox is a familiar-looking flyer priced to fit most pilot budgets and offered by a longtime LSA distributor, Rollison Light Sport Aircraft more info. 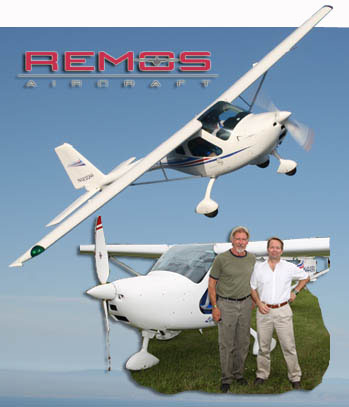 (top) Remos' G-3 is a long-gliding beauty whose 47-inch-wide cabin fits most Americans. 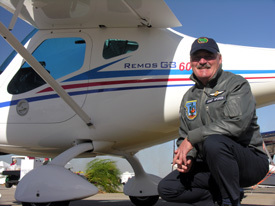 German flight school owner Josef Sporer poses near a Remos G-3. He says the landing gear has never been damaged even after 20,000 student landings! Rob Rollison imports the gorgeous Remos G-3. [2007 UPDATE: The new importer is Remos USA. Call: Toll Free: 888-838-9879] He is working closely with German designer Lorenz Kreitmayr to certify G-3 as a Special Light-Sport Aircraft. Early sales will be to sophisticated buyers that see the sleek machine as a personal aircraft with impressive performance. But at the Sebring Expo 2006, I met a German instructor who sees it differently. Josef Sporer somewhat hesitantly bought a G-3 to see if it would work in his flight school. After an astounding 20,000 landings and 3,500 hours on one aircraft, he is so convinced of the aircraft's sturdiness for instructional use that he's added a second one. So while the Remos aircraft looks like a dream, and boasts good gliding and cruising performance, it qualifies quite well as a trainer, too. Built since 1997, more than 164 are flying around the world. Rob Rollison imports the gorgeous Remos G-3. [2007 UPDATE: The new importer is Remos USA. Call: Toll Free: 888-838-9879] He is working closely with German designer Lorenz Kreitmayr to certify G-3 as a Special Light-Sport Aircraft. Early sales will be to sophisticated buyers that see the sleek machine as a personal aircraft with impressive performance. But at the Sebring Expo 2006, I met a German instructor who sees it differently. Josef Sporer somewhat hesitantly bought a G-3 to see if it would work in his flight school. After an astounding 20,000 landings and 3,500 hours on one aircraft, he is so convinced of the aircraft’s sturdiness for instructional use that he’s added a second one. So while the Remos aircraft looks like a dream, and boasts good gliding and cruising performance, it qualifies quite well as a trainer, too. Built since 1997, more than 164 are flying around the world. The overhead view of the Mirage shows off the skylight window in the roof of the cockpit as well as the 32- foot-long wing planform, which no doubt contributes to the aircraft's impressive 17:1 glide ratio. The Remos G-3 Mirage presents a sleek profile on the ultralight runway at EAA AirVenture Oshkosh 2002. Its carbon fiber construction and composite curves add to that appearance. The Mirage features gull-wing doors that can be flown open in flight up to 65 mph. However, the doors are also completely removable. The red knob/wire release mechanism shown makes it easy to accomplish that task if you're going flying on a hot summer day. The doors can latch open easily, and also feature keyed entry locks providing security. Lots of "glass" surrounds the Mirage's cockpit and that makes for great visibility from the aircraft, but that can also create more heat inside as well. The Mirage's designer recognized that and created lots of ways to bring cooling air into the cockpit. A NACA vent on each side of the cowling provides air to vents at the base of the windscreen a la automotive defrosters as well as to positionable air vents on the far edges of the instrument panel (see panel detail photo). In addition, there are vents in each window that can be opened and closed easily by the levers at the base of the window. The cockpit of the Mirage is a generous 46 inches wide. Four-point seat belt/shoulder harnesses secure both occupants, while the carbon fiber construction offers a comfortable seating arrangement. 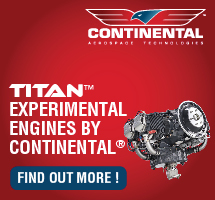 Full dual controls make the aircraft a practical trainer. A combination of traditional gauges and computerized readouts offer the best of both worlds. Note the flap and trim indicators alongside the turn-and-bank indicator and the dual throttles, allowing pilot or copilot to fly with a conventional left-hand throttle/righthand stick combination. The Mirage that Dan Johnson tested was powered with the 100-hp Rotax 912S engine, as shown nicely packaged here. 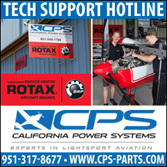 The 80-hp Rotax 912 is also an option, though Dan believes most pilots will choose to opt for the higherpowered engine. Always efficient, the German Remos folks have a specially designed trailer, also a la sailplane style, for transporting and storing the Mirage. Of course, the trailer itself is too large to crate and import to the United States, however, this photo does give enterprising folks an idea of a trailer idea they might adapt for transport and storage here. The Mirage's folding wing can be assembled/ disassembled by two people in about 15 minutes, making storage off airport a practical reality. Mirage won "Airplane of the Year" from an impressive field of candidates at the 2001 Aero Airshow in Friedrichshafen, Germany. 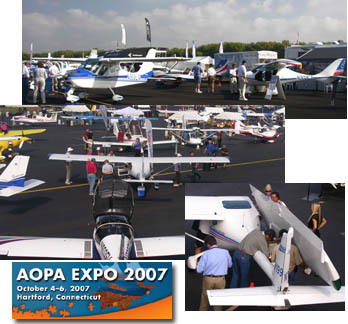 “White, composite, and from overseas”…was a theme of EAA AirVenture Oshkosh 2002 in the ultralight/lightplane area. I’ve already congratulated Experimenter Editor Mary Jones and Art Director Pierre Kotze on the October issue’s beautiful layout of the aircraft from afar, which may become near and dear to Yankee pilots. This month, I’d like to introduce you to one of the new flock of white, composite, and overseas aircraft—Remos Aircraft’s G-3 Mirage. For the second EAA AirVenture Oshkosh in a row, I was delighted to fly with Allistair Wilson, an Irishman now residing in the United States. Like last year, he is working with Rob Rollison and the Rollison Light Sport Aircraft Inc., based in Bloomfield, Indiana. Last year, Allistair and I flew in the Flight Designs CT. This year it was the Remos G-3. Both are white, composite, and from overseas. The trend is real! The Factory and People In addition to flying with Allistair at AirVenture, I also chanced to meet the G-3 Mirage designer, Lorenz Kreitmayr, at a French ultralight show called Blois (the town it’s near). Lorenz is an inspiring fellow. He has created such a beautiful aircraft (as well as a dashing low wing to come next April), yet he is confined to a motorized wheelchair and requires assistance with basic tasks. A great attitude shows in a wide smile and an intimate command of aircraft design knowledge. Did I mention he speaks English fluently? He’s a remarkable gentleman; meeting him helped explain the Mirage. The Remos G-3 Mirage is an unusual aircraft—at least as compared to most American designs—in that it has a superlative glide angle and low sink rate. Europeans who often start flying in sailplanes may take such performance in stride, but a 17:1 glide and descent in the 350 fpm range are close to double the U.S. powered light aircraft standard. The aircraft uses its sleek composite curves efficiently and has enough wing area to keep stalls below 40 mph. With its weight dimensions and speed range, the G-3 Mirage is ready to fly when the light-sport aircraft category emerges. Rob Rollison, the U.S. importer, has logged a few vigorous years of seeking out just the right international aircraft to sell in the United States. He seems to have settled on a fleet of Pegasus trikes, the German-built Ikarus C-42, and the German-designed, Polish-fabricated, German- assembled Remos G-3 Mirage. From the deluxe Pegasus line, you step up in price until the Mirage at the top of the stack. Rob has learned a few lessons and has chosen his offerings well in my estimation. Hitting the Highlights Because Rob is a successful light aircraft seller in a challenging market, it makes sense to ask him for the highlights of the Mirage. He ticks off a few things that he believes distinguish the G-3: • carbon-fiber construction (not mere Fiberglas) • folding wings (for transport or for storing aircraft in tight spaces) • wide, roomy cockpit (cockpit width— 46.8 inches) • comfortable adjustable seats, with fourpoint shoulder harnesses • powerful Rotax 912S, 100-hp, fourcylinder, four-stroke engine • stainless steel exhaust with aftermuffler for additional noise reduction • cabin heater, special ventilation system, and pop-out vents on both door windows • exceptional visibility with tinted windscreens made of special aircraft-optical acrylic • large skylight • gull-wing doors that are quick-removable for flying without doors; the Mirage can be flown with the doors open in flight (up to 65 mph) • manual flaps and electric elevator trim • fuel filler cap conveniently located (no climbing on ladders necessary) • the Remos G-3 Mirage is a factory-built aircraft, test-flown in Germany, and again in the United States, and delivered ready-to-fly! To Rob’s list, I want to add a few observations of my own. The Mirage features a clean looking, single strut construction with a single jury strut. Such simplicity nonetheless passes German regulations for ultralights and no doubt helps with the wing folding mechanism. American buyers have longed embraced folding wings; Kreitmayr designed an elegant system. Folding the wings takes two people about 15 minutes; the process goes like this: 1) A small fairing at the base of the rudder allows you access to the quick-release linkage for the elevator controls. (As a point of interest this fairing is removable, and you can install a glider towing release mechanism.) Then two large pins on either side of the vertical, secured by a safety pin, are removed, and you can detach the entire horizontal surface. 2) Next, you move inside the cockpit where you remove more pins to unlink the aileron controls. Back outside, at the fuselage/wing leading edge junction, you pull out a large pin on each side. 3) At this time you pull out on the wing slightly, which allows access to the quick-release pins that secure the flap controls. 4) The struts have a rotating ball joint that allows the strut and jury strut to stay on while you fold each wing aft. 5) Finally an extra piece of hardware fits over the tail boom and supports the wings in storage. Other Fine Touches The Mirage’s electric elevator trim linkage functions in a slot on the bottom of the elevator but is smooth on the top. Total movement is only about a quarter inch. It’s another of those sophisticated techniques that shows good forethought and helps to justify the price tag. The Mirage’s cut-out center of the elevator is not for rudder movement as you might think. Instead, it’s done to accommodate the glider towing function the Mirage sometimes serves. In Europe, glider flying is four times as big as it is in America, so being fit for such duty makes the Mirage a better value. Though the engine is quite tightly cowled, an opening in the front serves the radiator. Inside the curvaceous cowling, the Remos shoehorns a Rotax 912 and all its components. The G-3 Mirage’s wings are of carbon fiber construction with fabric on the aft two thirds. 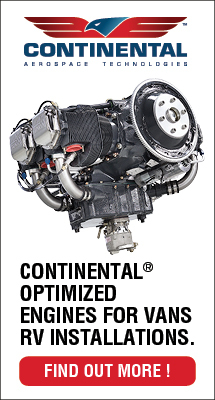 This genuinely composite method helps keep the aircraft lighter and, in turn, helps create the long glide and slow sink performance. The aircraft fuselage and wings are built in Poland with the final assembly done in the southern Bavarian region of Germany. A little vertical ventral fin—on the lower side of the tail—has a small wheel smoothly built into the structure. It’s yet another of the many nice touches that Kreitmayr included in his work. One Deluxe Cabin Environment The G-3 Mirage has enough features and appointments that you have to consider them in a pattern. After getting in, I noted the locked parking brake, which is housed in the center console. The device involves a hydraulic brake lever with a red knob just aft of the lever and its hydraulic reservoir. You prime the system by pushing forward on the brake lever. When you twist the T-handled brake lever to the right, to the three o’clock position, you set the park brake. It’s more complicated to explain than to do. Just in front of the hand brake lever is another right-twisting knob, the fuel cutoff. Logically, it should be in the forward position for “go.” A fairly small storage area for an overnight bag is behind the left side seat. Kreitmayr also provided some small nylon net stash areas located on the backside of each seat. In addition, you also have map pockets located in the doors and some additional storage area can be found under the seats. No space is wasted. 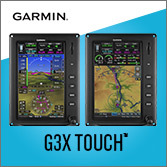 The cabin provides full dual controls, which makes it useful for flight training. Each control stick has a push-to-talk switch. One Mirage owner, a former German jet pilot, has logged 1,500 hours and 8,000 landings in flight school operations using a G-3. In front of the brake control handle in our test aircraft were four colored knobs under the key switch control—fresh air (blue/lower left), cabin heat (red/lower right), carb heat (yellow/top right), and choke (green/top left). Above the key switch is a series of electric switches, the largest one being the master switch. Something you rarely see on American designs are removable doors. A large red knob just to the side of either pilot’s head provides a quick release for the doors, facilitating easy removal. You can fly this aircraft with the doors off, and this quick release also addresses emergency situations. Oshkosh can be a hot place when Air- Venture happens. One nice touch for such warm days is a system of air vents consisting of no less than five openings. A NACA inlet on the right side of the fuselage supplies the air to all. Some of the outlets are at the base of the windscreen, modeled after defroster vents on cars. Others are airliner-type movable air vents on each end of the control panel, plus openings in the side windows. As I said above, you can remove the doors or fly with them open (below 65 mph), but if you have the doors on, you want them to be secure. Mirage’s door hold latch asks you to pull down on a pin system, holding the door as you do so. Once seated, moving a knob forward located at your knee pushes down three pins to fix and lock the door. One angles forward into the fuselage, one down, and one aft to firmly secure the door. When it’s time to exit, as you lift the door to the gull-wing position, you push a latch pin up into a dimpled catch. It works slickly and holds the door open as you unload. These special fittings are also able to fix the doors open in flight, within the speed limitation. Once you’re ready to put the Mirage away, you can use a pickproof lock and key to secure your valuables. One more nice touch is a fueling port on the right rear of the body (just above the word Remos on the airplane used for this evaluation—DMPLK). You won’t have to stand on a ladder to fuel the high wing design. The Remos G-3 Mirage is a ripe candidate for the proposed light-sport aircraft category, assuming it will also be able to meet the consensus standards. 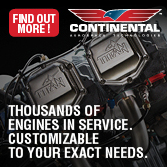 It is conventional in its general shape and handling and can be operated the same way lots of general aviation pilots fly their Cessnas and Pipers. However, Mirage also has ultralight-like characteristics with fast takeoffs, steep climbs, and great performance-per-cost ratio. And, it pegs high on the fun meter! Our Flight Of two possible flap notches, Allistair preferred to use one notch for takeoff from AirVenture’s “down-on-the-farm” ultralight runway. The two settings available are at 15 and 30 degrees. Once into the crowded ultralight pattern, Allistair and I kept our eyes peeled for conflicting traffic. The Mirage’s excellent lateral and forward visibility helped. It also has a skylight window, though it is further aft to make room for the spar. The skylight provides good in-turn visibility to the opposite side on which you are seated. To your own side, visibility in turns is restricted. Our test Mirage had a 100-hp 912S engine installed, but you can elect the 80-hp model and save a few dollars (though not enough to be worth it, in my opinion). This particular aircraft also used a combination wood and composite prop. High-speed cruise appears to be 120 mph. The Mirage has a good speed range from its stall below 40 mph, but according to Allistair, 110 mph will produce a very comfortable cruise. He ought to know having flown the aircraft from southern Indiana to participate in the big show. With the flaps up and throttle at just over 5,000 rpm, I flew the Mirage with the ASI indicating 115 mph airspeed at about 1,400 MSL. Steep turns required no back pressure. If I pulled aft in such turns, I simply climbed even when the maneuver was done at a medium power setting. No push of the throttle was required—as is necessary in most aircraft—indicating an efficient airfoil. For all of Mirage’s virtues, I did experience some initial challenge keeping the ball centered. The G-3 tended to drift off to the left side, and I felt like it needed some opposite control when turning that direction. Both Allistair and I felt this might be because of the torque from the larger Rotax 912 powerplant. One of the most amazing discoveries came when I recorded a 300-350 fpm descent rate at about 70 mph. The Mirage has a most impressive sink rate that beats most ultralights or general aviation airplanes I’ve flown. Allistair indicates the glide is an equally impressive 17:1. While I had no way to verify that fact, the Mirage certainly didn’t want to come out of the sky and appeared to substantiate a flat glide. Allistair demonstrated slow flight with full flaps, 3,800 rpm, and 60 mph, which felt very solid. He agreed that the Mirage does get a little soft in control at 55-60 mph, but it still has plenty of roll control. When I took the controls, I could hardly note the softness; the Mirage retains enough authority even at 50 mph to be fully controllable in a low-wind approach. One thing I enjoyed as Allistair and I switched taking control was the genuinely full nature of the dual controls. For example, both seats have a left side throttle allowing pilots to keep their right hand on the joystick. The trim lever was mounted on the joystick of this Mirage; logically, you move the switch forward for nose down and back for up. The trim control operates a surface only on the left elevator. Just above the VSI on the left side of the panel is a small, white dial that shows the trim position, yet another nice touch. As we reentered AirVenture’s ultralight pattern, I turned the controls back over to Allistair. Maintaining one notch of flaps down, Allistair was able to hold 75 mph easily; we had slower traffic ahead of us in the crowded pattern. Out in the free flying area, I’d been able to back off the throttle to about 3,500 rpm and hold 60 mph, good for times when you need a slow-flight operation. The Mirage’s long glide made for a challenging landing when it came time to put it down. The range of speeds among the intermixed aircraft can be wide, and sometimes you have to improvise in order to fit in the procession. We landed long and Allistair got on the brakes quite aggressively. Thanks to some throttle creep he went further than he planned, eventually killing the engine on the far end of the 1,400-foot strip to come to a complete stop. Despite our speedy touchdown, the Mirage’s composite landing gear felt very supportive. 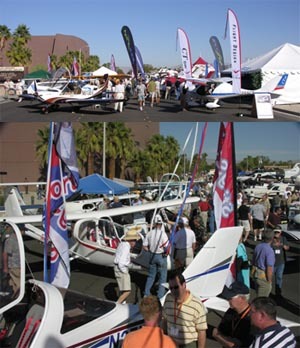 Waiting on Sport Pilot One of the vexing problems right now in the light aircraft industry is that many buyers are sitting on the fence waiting to see if/when the proposed sport pilot/light-sport aircraft rule will pass. In some sense, that’s wasted flying hours. If/when the rule passes, aircraft like the G-3 Mirage will be candidates for your airplane-buying dollars. But you have a number of purchase choices today for aircraft that should qualify when the new rule is final. 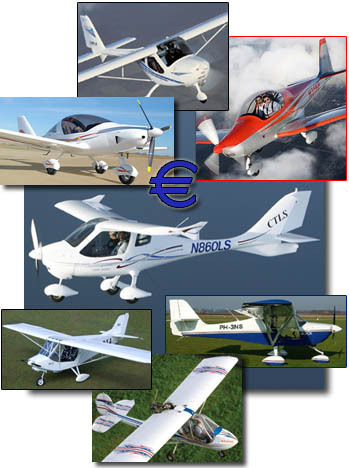 Nearly every kit-built model from the major light aircraft manufacturers could eventually qualify as a light-sport aircraft (if the manufacturer is willing to go through the process of verifying that the aircraft meets the yet-to-be finalized consensus standard). The rule will allow both kits and fully built aircraft. Thus, while it’s nice to dream about buying a ready-to-fly aircraft like this G-3 Mirage, you needn’t put your plans on hold while FAA sorts out the rule. In addition, there is quite a range of legal Part-103 models you can buy that will not be affected by the rule. That said, most pilots I talk to like the idea of fully factory-built aircraft. If this is your preference, Remos makes one aircraft you should consider carefully. At $64,950, the Mirage is one of the higherend choices, but it’s also one of the higher-end offerings. 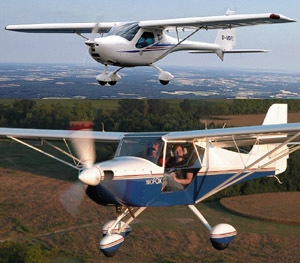 Rollison Light Sport Aircraft’s Ikarus C-42, at $22,000 less, is an example of a much more moderately priced offering. (Editor’s Note: We’ll ask Dan to review that aircraft in another article in the coming months…M.J.) Standard equipment on the Remos G- 3 Mirage includes an airspeed indicator, vertical speed indicator, precision 20,000-foot altimeter, compass, slip indicator, electric fuel gauge, and Rotax Fly- Dat digital engine monitoring system (which provides tachometer, water temperature, four EGT temperatures, oil pressure, and oil temperature). Mirage is so deluxe that you can’t choose from many options. However, Rob is a strong promoter of emergency parachutes and says the Mirage is “set up for easy installation of the optional BRS aircraft recovery system.” As of AirVenture 2002, Rollison Light Sport Aircraft reports that 112 Mirages are flying in Europe. That number is bound to grow when FAA releases their new rule. If it fits your pocketbook, I feel very confident in saying one flight in a Mirage will make you ready to part with your cash. Notes: * With wings folded, height is 5.5 feet. **Final gross weight is pending issuance of the light-sport aircraft rule. Performance Max cruise speed 130 mph Max level speed 142 mph Stall speed 38 mph Max rate of climb 1,300 fpm. Notes: *** With fixed-pitch prop as required by the sport pilot proposal. 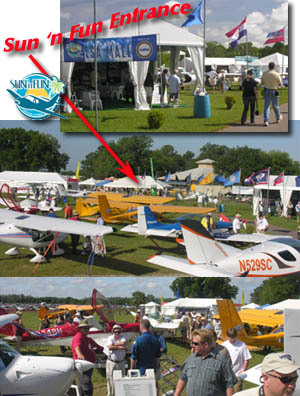 “White, composite, and from overseas”…was a theme of EAA AirVenture Oshkosh 2002 in the ultralight/lightplane area. I’ve already congratulated Experimenter Editor Mary Jones and Art Director Pierre Kotze on the October issue’s beautiful layout of the aircraft from afar, which may become near and dear to Yankee pilots. This month, I’d like to introduce you to one of the new flock of white, composite, and overseas aircraft—Remos Aircraft’s G-3 Mirage. For the second EAA AirVenture Oshkosh in a row, I was delighted to fly with Allistair Wilson, an Irishman now residing in the United States. Like last year, he is working with Rob Rollison and the Rollison Light Sport Aircraft Inc., based in Bloomfield, Indiana. Last year, Allistair and I flew in the Flight Designs CT. This year it was the Remos G-3. Both are white, composite, and from overseas. The trend is real! The Factory and People In addition to flying with Allistair at AirVenture, I also chanced to meet the G-3 Mirage designer, Lorenz Kreitmayr, at a French ultralight show called Blois (the town it’s near).